RainSaucer - What is the difference between Food Safe and Food Grade? What is the difference between Food Safe and Food Grade? It took us a few years in this business and lots of discussions with plastics companies to finally understand the subtle difference between food safe and food grade plastic barrels. Part of the confusion is that both types are made of HDPE, a material that is designated as "food safe" by the FDA. Food safe means it can come in contact with the food you eat and you will be safe. Food safe is OK for a wide variety of kitchen uses but not necessarily for long term storage. That is where food grade comes in. The FDA reserves food grade for food packaging and is designed to ensure the long term safety of the food in the container. The idea is to prevent leaching: food grade plastic does not contain any dyes or recycled plastic deemed harmful to humans. In addition, the food grade designation means no other harmful chemicals were used in either the resin or in production of the plastic container. So what does this mean for RainSaucers™ and the application to drinking water? As you may know, our catchment system is made of 100% virgin, no-dye HDPE- meaning its highly food safe and ideal for catching water and relaying it to a barrel or bucket. 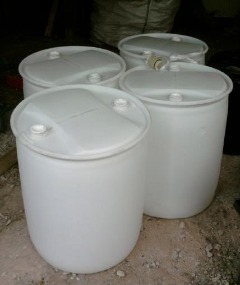 The key then is to make sure that any barrel being used in conjunction with our system for drinking water should be food grade and say so on the container. This is in addition to the other considerations we have mentioned previously.